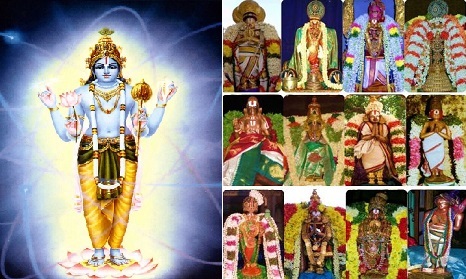 In the ninth pAsuram, AzhwAr says “This world is filled with those SrIvaishNavas who enjoy serving bhagavAn and those SrIvaishNavas who sustain themselves by meditating upon bhagavAn’s qualities and cannot do anything beyond that; hence, you too being ananyaprayOjana (exclusively devoted without any ulterior motives) serve bhagavAn and be uplifted”. This world became filled the devotees of sarvESvaran who never abandons [his devotees], the servitors and sages of bhagavAn, who are ananyaprayOjanas who keep reciting in their tongues the special and very purifying hymns such as SrI purusha sUktha, SrI nArAyaNa anuvAka and are preserving the boundaries of the SAsthram which reveal gyAnam in the form of bhakthi, and are approaching him through servitude and are having flowers, fragrance/incense smoke, lamp, sandalwood paste and water completely. This being the case, you all be uplifted by approaching and worshipping them. mEvi … – Become an ananyaprayOjana and be uplifted. vEdhap punidha irukkai nAvil koNdu – Reciting the sacred hymns of SrI purusha sUktham etc which reveal more about his true nature, distinguished form and qualities rather than his wealth [of spiritual and material realm]. achchudhan thannai – emperumAn is of the nature that, even if they recite such hymns in their tongues without their hearts’ intent, still he will consider them to be reciting it heartily and will tell them as in SrI rAmAyaNam yudhdha kANdam 8.3 “na thyajEyam kathanchana” (I will never abandon this vibhIshaNa who approached me with friendship). gyAna vidhi pizhaiyAmE – gyAnam indicates bhakthi which is a special form of gyAnam. Not skipping any of the activities which are forced upon oneself by their own devotion. pUvil … – The world became filled with SrIVaishNavas who have abundance of flower and incense and other materials which are used in worship and will serve him constantly and who are unable to do anything but [constantly] meditating upon emperumAn‘s qualities. This world became filled with those who are like iLaiya perumAL (lakshmaNa) (who follows emperumAn constantly and serves SrIrAma) and SrI bharathAzhwAn (who remained outside ayOdhyA constantly meditating upon SrIrAma); you too approach them, serve them and be uplifted. This entry was posted in thiruvAimozhi, thiruvAimozhi 5th centum on June 1, 2017 by Sarathy Thothathri.